For Dr. Aziz life, and oral health, are full of adventures. Pediatric dentistry is caring for growing mouths that are constantly changing as are their needs. Dr Aziz loves this aspect of pediatric dentistry and looks forward to caring for the growth and development of all of your child’s oral health needs as a Wayland and Waltham pediatric dentist. She believes in establishing a solid foundation of good oral health. This begins with the earliest visits and through humanizing the dental instruments and having balloons and stickers ready for the littlest patients. Early visits are transformed into a positive experience for everyone. When children enjoy coming to the dentist, they will enjoy and be more dedicated to taking care of their oral health at home. Dr. Aziz’s goal is to educate her patients and their families and give them the tools and support for a life of healthy teeth and healthy smiles. Dr Aziz completed her undergraduate education in French, biology and economics from Tufts University where she then earned her D.M.D. 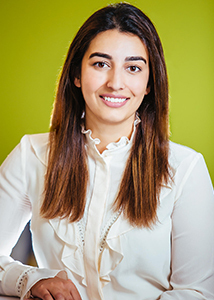 Dr Aziz also completed her pediatrics training at Tufts University School of Dental Medicine and took additional courses in child psychology to aid her in best treating her patients. She lives in Boston with her husband and daughter and enjoy adventuring through life and oral health together!